Amazon will unveil a new device that it thinks will surprise its customers, and everyone's invited. The company has opened up to the public an invite to a launch event on June 18 but you have to convince Amazon to give you a ticket to the event. 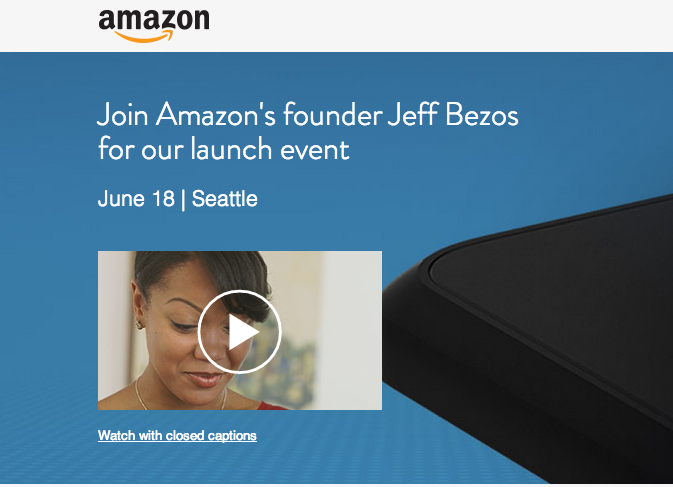 On Wednesday, Amazon tweeted a link to its online invite form Wednesday, telling customers to "Join Amazon's founder Jeff Bezos for our launch event" on June 18. Customers will have to submit a request for access, and all customers are required to write why they want to be at the event. Developers and journalists are also invited to submit their applications. To apply for a spot at the mystery device's launch event, Customers are asked to enter their email address associated with their Amazon account and the company will let everyone know by June 12 if they made it in. In case you live outside Seattle, Amazon will arrange travel and lodging in case you are invited. According to hints from Amazon's Twitter account indicate that the device could be the long-rumored Amazon smartphone. A video which was posted in one of the tweets depicts people looking down at an off-screen device in their hands, exclaiming things like, "awesome," and things like "it moved with me, " or "I don't think I've ever seen anything like this." Some earlier reports about the phone indicated that it would have 3D technology that would make objects appear to leap off the screen. In the developer application, Amazon asks developers to describe an "innovative way" they've used accelerometers, gyroscopes and sensors with applications. Additionally, it wants to know if they are interested in machine learning or want to develop apps that work with a "new type of sensor." This is the first time Amazon has broadcast one of its events so boldly and broadly. This is an unexpected move, given that large tech firms, Amazon included, typically keep tight reins over who gets invited to a launch event. But this time Amazon is challenging that image by opening its doors to the public instead of just partner developers and journalists. The company has repeatedly said it's number one focus is its customers, so the quasi-open invite to consumers may be another way for it to drive the point home. The company has faced plenty of public scrutiny recently due to its book pricing war with publisher Hachette. They have restricted the sale of titles from the publishing company as a negotiating tactic. While some of their consumers are frustrated that they can no longer order some book titles, Amazon has tried to pass off the move as a way of getting more value for its customers.